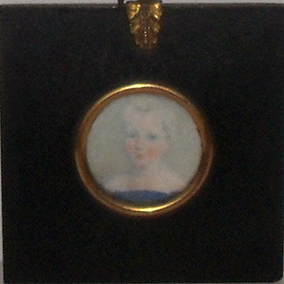 There is an almost ethereal quality about this Miniature. It is beautifully done and presented in its original frame. On the paper which covers the back, it tells us that the subject was 3 years old in 1814, but the name is unreadable. The child is simply beautiful with pixie-like blond hair, rosy cheeks and lips, and the sweetest smile on her bow shaped lips. Her eyes are mesmerizing and one wonders what thoughts this little 3 year old was thinking that would bring such a smile to her face.